The World Trade Organization (WTO) recently celebrated twenty years of existence. The general wisdom is that its dispute settlement institutions work well and its negotiation machinery goes through a phase of prolonged crises. Assessing the World Trade Organization overcomes this myopic view and takes stock of the WTO's achievements whilst going beyond existing disciplinary narratives. With chapters written by scholars who have closely observed the development of the WTO in recent years, this book presents the state of the art in thinking about WTO performance. It also considers important issues such as the origins of the multilateral system, the accession process and the WTO's interaction with other international organisations. The contributions shed new light on untold stories, critically review and present existing scholarship, and sketch new research avenues for a future generation of trade scholars. 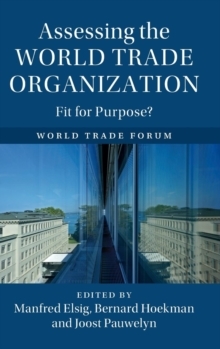 This book will appeal to a wide audience that aims to better understand the drivers and obstacles of WTO performance.